Within the Jeep community, there is an enthusiastic cult following of a family of Jeeps built during the 1950s known as Jeep forward control trucks. What is a Jeep Forward Control Truck? The "forward control" was a unique Jeep design created by Willys Motors engineer Brooks Steven. Most people credit Stevens with designing the Jeep forward control truck as part of his work on new Jeep designs following World War II. The design involved placing the cab of the vehicle directly over the engine. 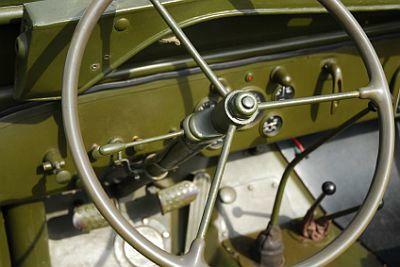 Many Jeep enthusiasts feel that the forward control design was ahead of its time. The first forward control Willys Jeep with the cab placed over the engine was the FC-100 in 1956. Since the cab was moved forward significantly, this left much more room behind the cab for a larger load. The load capacity was larger not only in size but also in total weight capacity since the overall cab size was smaller and lighter than most other trucks. The FC provided drivers with more than double the visibility of other vehicles within the same weight class. The fact that the hood was nonexistent opened up the front of the vehicle so that it was like looking out a large picture window at the road directly in front of you. Since the FC design was placed on the 81-inch Jeep wheelbase, the center of gravity and engine placement gave the vehicle not only more power than other trucks within its weight class, but it also made the FC much easier to drive, even when carrying a large load. The initial public reaction to this newly designed Jeep in 1956 was very positive. In 1957 alone, Willys produced almost 10,000 FC-150 and FC-170 trucks for the marketplace. Willys tried to advance the design further with the introduction of the FC-170 later the same year, but unfortunately the popularity of the design didn't last. In 1958, only just over 3,500 FC trucks were sold, and each subsequent year realized similarly low sales numbers until Willys discontinued the model in 1964. Even though the civilian market ultimately didn't support the new Jeep forward control trucks, there were some niche markets where it performed well. For example, the military versions included the M677, a four-door cab with a covered bed, and the M678, which many auto experts consider as one of the very first minivans ever invented. Even in the civilian market, there were areas where this model did well. Many communities and farmers purchased the FC Jeeps for use as dump trucks and fire trucks. It was recognized in the 1950s (and still is by many FC enthusiasts today) as one of the toughest Jeeps ever made.